Born in 1969, Lyphard (it is controversial regarding the pronounciation – but commonly pronounced Lee-Fard) was by the great Northern Dancer out of a mare called Goofed by Court Martial. 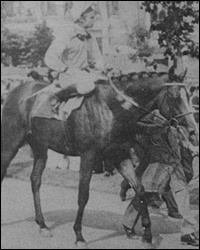 After being overlooked by Robert Sangster at the sale for being too small, a mistake Robert would never make again with a son of Northern Dancer (his bidding wars with Sheik Mohammed for Northern Dancers’ progeny became infamous along with record-breaking yearlings bought) he was sold as a weanling at November’s Keeneland Sales to Irishman Tim Rogers. Tim sent the young Lyphard to Newmarket in England and sold him on, and once again, the small colt was overlooked by Champion trainer Vincent O’ Brien for his diminutive size. Alec Head, a prominent french trainer and breeder, purchased him on behalf of Madame Germaine Wertheimer, widow of the prominent French horseman and owner of the famous House of Chanel, Pierre Wertheimer. Germaine Wertheimer gave Lyphard his name in honour of the Ukrainian-born French ballet dancer and choreographer Serge Lifar. Much like his infamous sire, he was small in stature but has been described as having a ‘lively temperament’ as most of Northern Dancers’ progeny are known for. He was smaller then his sire who stood 15.2hh, but as most of Northern Dancer’s progeny proved – size in this case didn’t matter, his heart made up for it. On the track, Lyphard competed in France, Ireland, and England, winning six of his twelve starts, including the Group One Prix Jacques Le Marois and Prix de la Forêt at age 3 and he won five stakes races over his career. Lyphard was retired after the end of the 1972 racing season, and sent to stand at stud at Haras d’Etreham in Normandy. His progeny included the filly Durtal who won the Cheveley Park Stakes and was the 1976 United Kingdom Champion 2-Year-Old Filly, plus the colt Pharly who won several races in France, including the Group One Prix de la Forêt, Prix Lupin and Prix du Moulin de Longchamp. After his owner Madame Wertheimer died in 1974, Lyphard was sent to stand at Gainsway Farm in Kentucky. Lyphard produced 115 graded stakes race winners from 843 foals and the broodmare sire of 196 stakes winners. Some of his progeny include the great racemare Three Troikas who won the 1979 Prix de l’Arc de Triomphe, Dancing Brave who was the European Horse of the Year, Manila who won the 1986 Breeders’ Cup Turf and was subsequently voted US Champion Male Turf Horse, and ranked the best long-distance turf horse in American racing history by Steve Davidowitz of Daily Racing Form. Lyphard was voted Champion sire in the USA in 1986 with $6 million. He led the French sire list in 1978 and 1979 as well as the broodmare sire list in 1985 and 1986. 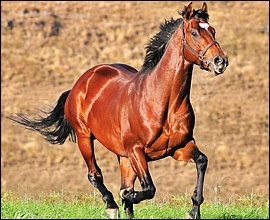 He was also Champion sire in Czech Republic in 1999, 2004, 2005 and 2006, and Champion sire in Slovakian Republic in 1999. His daughter Jolypha was Champion 3-Year-Old Filly in France. She won the 1992 Prix de Diane and Prix Vermeille and was a strong third in that year’s Breeders’ Cup Classic behind Eclipse Award Champion Pleasant Tap and the race winner, the future US Hall of Fame colt and now a major stallion, A.P. Indy. Lyphard is the damsire of Hatoof, winner of the 1992 1,000 Guineas and the 1994 US Champion Female Turf Horse, as well as the grandsire of 1993 Epsom Derby winner Commander in Chief, Tight Spot and multiple grade I winners Heritage of Gold ($2,381,762) and Skimming ($2,286,601) in addition to nine other champions. Among his other descendants are Deep Impact, Japan’s Horse of the Year in 2005 & 2006, and the No.1 ranked horse in the world in 2006, Invasor. His sons who had the most influence at stud were Lypheor, Pharly, Bellypha and Lyphard’s Wish. 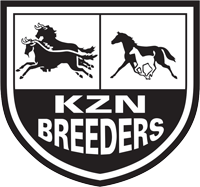 In South Africa, his son Elliodor proved himself a Sire-of-sires, and a broodmare sire. His more recent Kentucky Derby winning descendant is Animal Kingdom, and Lyphard appears in both his sire and damline through Candy Stripes and Dancing Brave. In KZN Lyphard is represented by three stallions, he is the broodmare sire of the beautiful Jam Alley(AUS), winner of the Grade 1 SA Classic over 1800m. Jam Alley is owned and was raced by trainer and breeder, St John Gray of Graystone Stud, and he stands at Hadlow Stud. 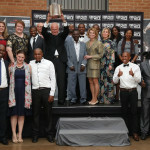 From just 11 of his first runners to hit the tracks in South Africa, two are already winners, and 6 have placed. He stamps his foals and they are large, correct individuals. He recently sired a colt out of Dancewiththedevil’s dam, Emperor’s Dance, which is going to be an exciting prospect when the colt reaches the track. 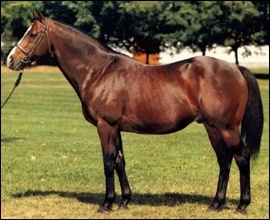 Lyphard is the broodmare sire of Groom Dancer, sire of Kabool(GB), standing at Highover Stud. At the 2008 Emperor’s Palace National Yearling Sale, a daughter of Kabool out of French Sun sold for R750 000. 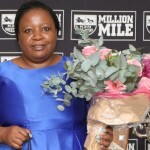 His son, Brilliant Cut, out of an Elliodor mare (Elliodor is a son of Lyphard), has won two Grade three’s between 1200-1500m, being the Betting World COGH Nursery and the Betting World Langerman. Lyphard is the broodmare sire of Bellypha, who in turn is the broodmare sire of the talented young stallion Mullins Bay(IRE) at Summerhill Stud, winner of the Grade 3 Strensall Stakes. He is producing good looking and athletic foals. 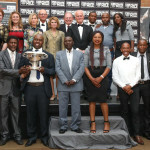 At the 2011 Emperor’s Palace Ready-To-Run Sale, he sold a two-year old for R300 000 called The Mutineer. 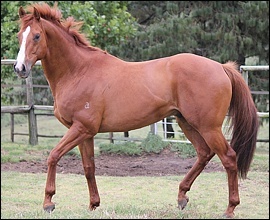 Pelican Brief who resides at Spring Valley Stud, is the dam of Vodacom Durban July winner Dunford and Grisham, is due to foal by Mullins Bay this season, and Alec Hogg of Graceland Farm recently announced the exciting birth on his daily blog of a large athletic filly out of his Northern Guest mare Dancing Belle, now named Saint Joan. Alec describes his feeling of Mullins Bay on his blog as “it’s only a matter of time before the son of Machiavellian is as good a sire as his international champion father”, and Summerhill Stud have said he may be “the next big sire”. In 1996, Lyphard was pensioned from stallion duty at age 27 and lived another nine years. He was one of the oldest horses in the world at the time he was humanely euthanized on June 10, 2005 as a result of the infirmities of his very old age. He was 36 years of age when he died and it has been said that he was one of the oldest horses in the world at the time.